Leeds is awash with cultured cuisine from all corners of the globe. If you want it, you can get it. And you don’t have to do much searching to find it. But sometimes you want to take a step back and eat British. And George’s Great British Kitchen is the place to be when you want traditional British grub, with a bit of a twist. We paid them a visit on a Monday tea-time to check the place out and were warmly greeted at the door, before being led out of Leeds to Robin Hood’s Bay; a booth named after the quaint North Yorkshire fishing village. A touch we loved, and a simple, but nice way of keeping the British theme running throughout the place. There were a few tables in, which we thought was impressive for a Monday evening. Plus, there was already a lovely atmosphere, made up of families, work mates and other groups. People seemed happy, and that set things off to a great start. And as Katie brought us over a couple of pints of lager, we had a browse at the menu, and I caught up with a very old friend. As the name of the place suggests, the menu has some good old British fayre for the hungry. Burgers, fish, from-the-grill options and more – but I did have fish and chips on my mind since we were in Robin Hood’s Bay – and a couple of dishes popped right out for me. For starters, I wanted to try the Mushy Pea Fritters (£4.95), and follow that up with Wild Ocean Cod in Smoked Paprika Batter (£14.95). You can choose to have your chips a number of ways, but I went for the standard offering and looked forward to my great British meal, with an Indian twist. 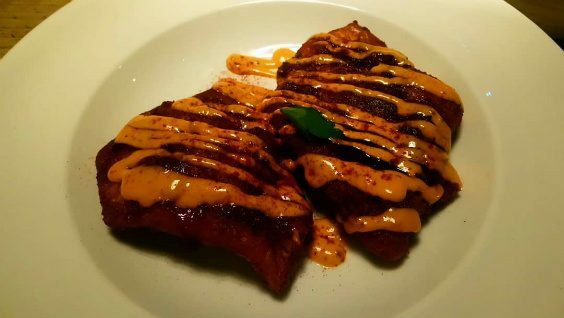 One of the main reasons for choosing to come to Georges Great British Kitchen was the compact selection of vegan dishes they have on the menu. 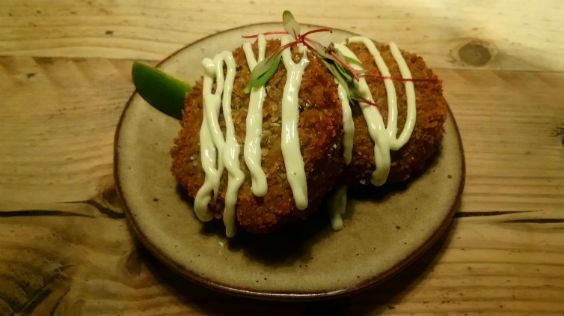 With an ever increasing demand for quality vegan food, Georges British Kitchen has taken that on board and sprinkled a few options in to their main menu, much to my friend’s pleasure. She decided to go for the Quinoa and Wild Mushroom Parcel as her starter (£6.25) and the Oriental Hoisin wraps at £11.95. Katie took our order and told us our food wouldn’t be long. That let us sit back, chat, and enjoy the surroundings. The restaurant has that kind of semi industrial-meets-minimalist feel about it. But it encompasses comfort and quality all the same. A nice balance – and bowler hats resting on handrails tied the British theme in to the room spiffingly. As our starters came, the presentation that was laid in front of us was excellent. Georges Great British Kitchen almost put extra Britishness in to their dishes with a neat and tidy look to them. My fritters looked fantastic, and came with a beautiful aroma. (Yes – mushy peas DO have a nice smell!). On first taste, it delivered the flavour nice and clearly, with a completely different texture. I loved what they’d done, and savoured it. They served two up, which were larger than I anticipated and I’m glad they did. A perfectly sized, tasty starter which got me ready for Fish and Chips. My friend loved her Quinoa and Wild Mushroom Parcel too. Again, presented nicely, and with fine layers of caramelised tofu, filled with warm quinoa and mushrooms, it went down a treat. Accompanied with Gauchang Chilli Cream, we were both pleased with our first courses. With great company and great food, the evening was going swimmingly. The vibe in Georges Great British Kitchen has very social kind of feel, with down to earth staff making the whole place a nice location to be. Not long after our starters were cleared, our main course was brought out. And again, each dish was presented so well. Like my starter, my fish came with a lovely aroma to it – and the taste was tremendous. It was succulent, and the paprika carried a subtle flavour which delivered on the tastebuds, but didn’t overpower the fish. It was a really good choice, and in true Great British tradition, I doff my cap to the chef. My friend was pretty impressed too. The vegan Grilled Mock Duck with Lettuce Wraps. This came with salted cashews, shredded leek and cucumber, with homemade hoisin dip. 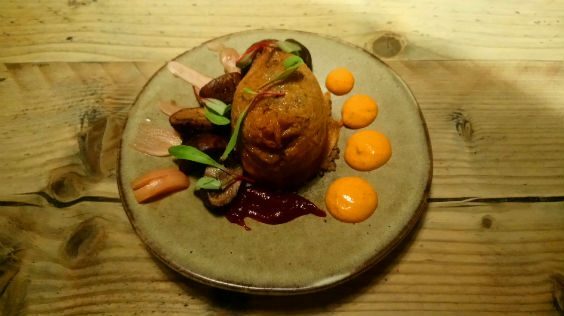 Georges Great British Kitchen aren’t just making sure the vegan clientele has an option, they craft something as special as the rest of the menu. The way it should be. After two fantastic courses we were quite full, but offered dessert. Do we remain here in Georges Great British Kitchen and devour a third course? Or do we leave? Well, we voted to remain, and we’re glad we did. I asked Katie for her recommendation for dessert and without hesitation she pointed out the sticky ginger pudding and, to be fair, that’d caught my eye. 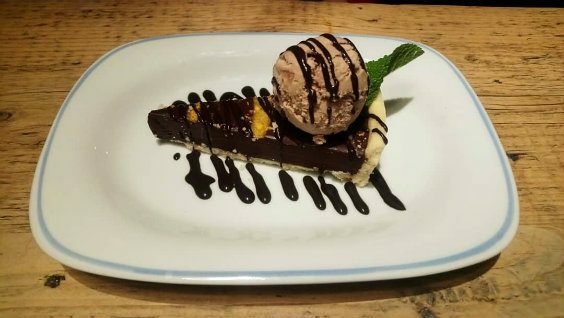 It came with ice cream AND custard, and like my friend rightly said: “Why have ice-cream or custard when you can have both?” My friend opted for the vegan friendly Chocolate Orange Tart. Katie had been first class in serving us all evening, and her recommendation was perfect too. The pudding was a good size, and the ice cream against the ginger was nice. I used a little drizzle of custard as opposed to lashings of it – my taste – and it was a great way to finish off a great night. If you’re visiting The Light, don’t forget that there’s a number of eatery options on the outside of the building, and not just inside. And one of those is George’s Great British Kitchen. It’s a great place, with even better service; and the food is an absolute treat.